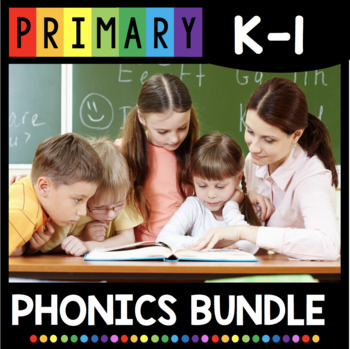 This curriculum gives you everything you need to teach phonics in kindergarten! These units also work great for first and second grade classrooms as well. I help you target and plan your lessons using sequential, systematic instructional units. These adorable, hand-on lessons will have your students engaged and learning the standards they need to become confident, fluent readers. I take you from beginning of the year in kindergarten learning letter sounds, through segmenting and blending CVC words (first, middle and last sounds), studying word families, consonant blends, digraphs and ending with long vowels. Each unit comes complete with literacy centers, anchor charts, no prep activities and worksheets. 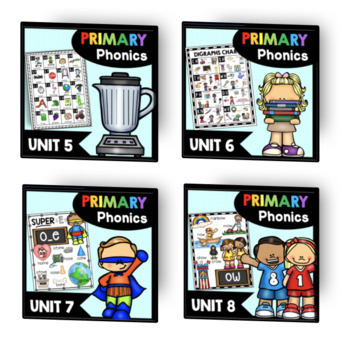 The units at the beginning of the year even come with pre/post unit assessments to help you see what students already know, as well as chart student progress. Save money by purchasing all 8 UNITS in this one bundle! Click each link below to see photos, previews and more! Everything you need to teach phonics in kindergarten! 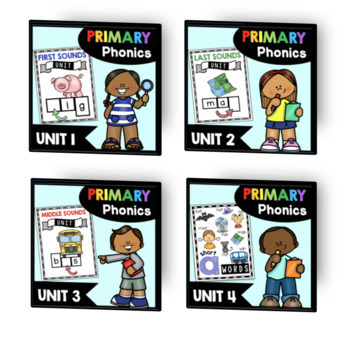 These units also work great for first and second grade classrooms, as well as some Pre-K classes too! "So comprehensive and easy to use! Love it!" "So excited to use this in small groups with some students who need extra review and practice! Thanks so much for making this unit work for a variety of early learning grades!" "I'm hooked! I LOVE your stuff!" "Absolutely love this resource! It has been super helpful for my kiddos! Thank you!" "So great for small groups, stations, and intervention! Thank you!" "Great work, in both color and black and white. The differentiated worksheets allow me to use with all my different level reading groups!" "I love everything Keeping my Kinder Busy!" "What fun and engaging ways to practice reading and writing CVC words! My kiddos are going to love this resource. Thanks!" "I really love how complete this pack is and how easy it is to use! Thank you so much." THIS LISTING IS FOR PERSONAL OR SINGLE CLASSROOM USE ONLY. If you're planning on using this resource for an entire school or district, please purchase the appropriate license. Thank you!